Scientists discover that certain materials like silicon or gold exhibit a surprisingly large refractive index for extremely high energetic gamma-rays. The research group of Prof. Dietrich Habs, in collaboration with scientists from the Laue-Langevin Institute, has opened a new chapter in the field of optics: Performing measurements with gamma-rays from the ILL high flux reactor they made the discovery that these extremely high energetic electromagnetic waves can be bent with lenses, similar to visible light, in contrast to prevailing theoretical predictions. This discovery will lead to a whole range of new applications, in particular in nuclear physics and nuclear medicine. Optical instruments, e.g. telescopes and microscopes, are based on the refraction properties of light: when electromagnetic radiation travels through a medium like glass, its speed is lower than in air or in vacuum. That is why it is deflected, e.g. onto the focal plane of a camera. The amount of this effect is described by the index of refraction, which depends on the material of the lens and the frequency of the waves. The more it differs from 1, the stronger is the deflection of the light rays. The high refractive index observed here for the first time provides new possibilities for developing gamma-ray optics which in turn will allow for new gamma-ray sources with optimized properties. 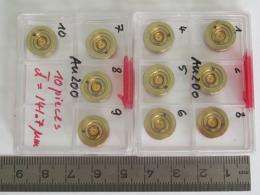 These will offer a whole range of new applications: as gamma-rays penetrate the atoms and get as far as to their cores they are sensitive to the different isotopes of a chemical element. This will provide new opportunities for the detection of enriched uranium, for example. Toxic nuclear waste could be analyzed and “smashed” by gamma-rays even inside closed containers. But also medical treatments would profit from the discovery: For the detection of cancer cells usually other radioactive isotopes are required than for their treatment. New gamma-ray sources would make it possible to generate different isotopes of a particular element for different purposes. In summer the team of Prof. Habs will continue their measurements at the European Radiation Facility (ESRF) in Grenoble – this time using lenses made of gold (see picture below). “As the nuclei of gold atoms contain 79 protons, they will deflect gamma-rays even much stronger than silicon lenses”, Habs points out.